Avoid a rush to Heathrow and stay the night before you fly in a hotel near the airport. FHR offer a range of Heathrow hotels to suit all budgets from well known hotel brands such as Thistle, Crowne Plaza, Hilton & Holiday Inn. Driving to Heathrow? FHR offer hotels with up to 21 days holiday parking included in the price. We offer competitive deals for advanced bookings at a wide variety of Heathrow Airport hotels, with or without parking. Booking an airport hotel gives you the chance to relax before your trip and freshen up with a hot shower and a good night's sleep before boarding your plane the next day. A stay at a Heathrow Airport Hotel can add an extra day to your trip, allowing you to enjoy the luxury of a hotel the night before jetting off to your holiday destination. When you book a room at a Heathrow Airport Hotel with parking included, your trip will get off to a more relaxing start. You can avoid rushing to the airport and eliminate the stress of unexpected delays caused by traffic jams, train problems and poor weather. If you choose to drive to the airport, FHR can provide packages combining a Heathrow Hotel with parking for up to 21 days, saving you even more money. Booking a Heathrow airport hotel with parking package often costs less than the cost of airport parking on its own. Prices for Heathrow airport hotels will vary according to when you travel. If the hotel is off-airport, a transfer cost may apply in addition to the hotel room price. If you're looking for a Heathrow hotel that offers cheaper rates, book a room at the Thistle London Heathrow. Guests are treated to coffee and tea making facilities and all rooms have a flat screen LCD TV with Freeview. Complimentary toiletries will save you digging through luggage unnecessarily. For £5 per person each way, you can take the POD direct to Heathrow Terminal 5 from the hotel. Alternatively, book a stay at the Park Inn Hotel & Conference Centre London Heathrow. Conveniently located just minutes from Heathrow Airport, this hotel is perfect for leisure and business travellers. The hotel has an indoor heated swimming pool, Jacuzzi and sauna. If you're feeling energetic, make use of the fitness centre's cardiovascular equipment. And all this at amazing rates. Opting for an airport hotel with parking is ideal if you are travelling with children. Heathrow airport hotels that are geared up for families may include family rooms and facilities such as a children's play area or swimming pool. With a swimming pool, children's menu and WiFi, the Hilton (Terminal 4) Heathrow Airport hotel is a hit with children. If you have time to venture out, Thorpe Park is only 5 miles from the hotel, and Legoland just 8 miles away. This hotel is linked to Terminal 4 by a covered walkway, where you can also access the complimentary Heathrow Connect train service connecting to the other airport terminals. The Park Inn Hotel & Conference Centre London Heathrow is ideal for families. Children under 12 years of age eat free, with children's menus available throughout the week. WiFi is free, allowing older children to surf the net or keep in touch with friends on social networks. There are large family-friendly rooms, travel cots available and late check out if you want extra time to enjoy your stay. You can even pre-book swimming lessons in the hotel pool! For superb accommodation, just 10 minutes from Heathrow Airport, book a room at the Sheraton Skyline. This premier Heathrow Airport Hotel, has a four-star rating and features an indoor pool surrounded by tropical gardens, as well as an Italian restaurant and a sports bar. Hotel Hoppa transfers cost £5 each way, per person. If you want to treat your partner to a spot of luxury, Hilton (Terminal 5) is the hotel for you. Located just minutes from Heathrow's Terminal 5, this hotel is stylish and sophisticated, sporting triple glazing and king-sized beds. Unwind with complimentary access to Imagine Spa which includes a hydrotherapy pool, steam room, sauna, mineral grottos and aromatherapy showers. Then enjoy signature pan-Indian dishes at the award-winning restaurant, Mr Todiwala's Kitchen. 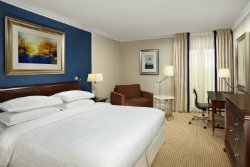 4* Hilton Garden Inn London Heathrow is just 10 minutes from Heathrow Airport. Couples can relax with a drink at the bar then enjoy a freshly cooked a la carte meal in the Garden Grille restaurant at the hotel, which also offers signature cooked-to-order breakfasts. Or treat yourself to room service, and relax watching a film on the LCD TV and trying out the contents of the minibar. Take advantage of our 4* Super Saver Rate. This will mean that you'll get fantastic value on a great hotel, but you only find out the name of the hotel after you have booked. Business travellers will love the Crowne Plaza London Heathrow, with its on-site nine-hole golf course and leisure club. Guests can choose to dine on high-end Indian cuisine through to traditional British dishes in the restaurants at this hotel. There is also an Irish Bar if you want a pint to help you unwind. Usual check in time is 3pm, check out is at 12pm, though early check in and late check out are available at this hotel for you to make the most of your time here. Alternatively, book a stay at the Thistle London Heathrow hotel. Free WiFi throughout the hotel helps the business traveller to keep on top of work and rooms have a work desk and trouser press for those en route to important meetings. The POD costs £5 per person and takes you directly from the hotel to Heathrow Terminal 5. For a real treat, stay at "UK Business Superbrands 2017" awarded hotel, Radisson Blu Edwardian Heathrow. This 4-star hotel has two restaurants, Annayu offering delicious Indian food and the Steak & Lobster Restaurant. It is advised to reserve your table in advance at these very popular restaurants. Enjoy a working lunch and coffee by day, or a cocktail and bar bites by night, in the vibrant Bijou Bar. And you can relax, revitalise and restore at the Pegasus Health Spa and Gym. Our Heathrow Airport Hotel options are listed below with guide prices for a double room with one week's parking. Click more information to find out more about a specific hotel. Nice room, very comfortable and really enjoyed the breakfast. Our car was left for 20days without any problems. Just excellent. Very Minor niggles When first registering you took a payment. I'm used to hotels taking swipe of my credit card. Just not used to this procedure. I was concerned the car park didn't have any barriers, though no apparent problems occurred during my stay. Thank you for a very nice stay and looking after my car. Room was good , check in was easy, hard to find a parking space & also not secure parking, but car was ok when we got back. Excellent hotel, conveniently located, with easy parking and generously-sized rooms. We are very pleased with the service and we are looking forward booking your hotel soon. Clean, comfortable, convenient. Plumbing problems prevent a higher score, but staff were very apologetic. Provided just what we required. Smart and professional. Top marks to the lady in charge of the breakfasts. Based on 674 recent reviews.